Debra Gwartney teaches nonfiction writing at Portland State University. In 2000, she was awarded an Oregon Literary Fellowship in literary nonfiction. Her writing has appeared in Creative Nonfiction, Prairie Schooner, Salon, and elsewhere. She is co-editor, with Barry Lopez, of Home Ground: Language for an American Landscape, published in 2006 by Trinity University Press. Debra took the time to answer some questions for us about memoir, getting published, and a good writing day. Paper Fort:What surprised you most in the writing of this book? Debra Gwartney: How long it took. I worked on the manuscript for nearly ten years. Writing about my personal life, and the lives of my children, required a whole lot of thinking and rethinking, revising and more revising. A few of the reviews have called the writing spare, and that’s what I was after, so those comments have made me feel that it was worth the wait. Paper Fort: Can you describe the process of finding a publisher? Debra Gwartney: I imagine like anyone else who’s had a manuscript out in the world for consideration by editors, I was pretty much a wreck during those weeks. But I have a wonderful agent who kept assuring me that the manuscript would land somewhere good. After eight or nine rejections, wrenching each one, I received a call from Deanne Urmy at Houghton Mifflin saying that she and her company wanted to publish the book, and that was a happy day indeed. PF: What advice can you offer to aspiring writers of memoir? Debra: To stay away from the trash talk about the genre. A lot of books are called memoir that aren’t memoir, but no one can do anything about that, except to read the best models out there and aspire to be somewhere in the same universe with those exquisite examples of personal narrative. PF: Can you describe a good writing day? Debra: I guess I feel like I’ve had a good writing day when something comes out that I didn’t know I was after—movement, or action, or language that I hadn’t come even close to in my mind (when imagining the scene or story)—but that emerged in the process of sitting at the computer and banging away at the keys. I like to surprise myself, I suppose, and provide myself with evidence now and then that I’m not so predictable as a writer after all. 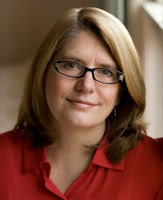 Debra Gwartney will be reading next Tuesday, March 10, at 7:00 p.m. at Broadway Books in Portland. She will also be reading on March 19th, at 7:00 p.m. at the University of Portland.